Other Products by Natures Best. Search other Amino Acids products. Natures's Best Isopure Aminos deliver the BCAA's in the proven 2:1:1 ratio. BCAA's are essential to protein synthesis and are knnown as the recovery amino acids. 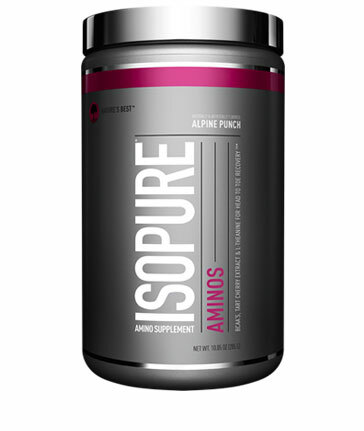 Along with the branched chain amino acids Isopure Aminos contain a combination of Tart Cherry and Threanine to reduce DOMS and calm the mind for complete recovery of both body and mind. Mix 1 scoop (9.5g) of Isopure Aminos with 295 - 350ml of cold water. Take 2 servings per day in addition to your Isopure protein. Best taken post-workout or before bed. Other Ingredients: Natural & Artificial Flavour, Citric Acid, Malic Acid, Tartaric Acid, Silicon Dioxide, Calcium Silicate, Soy Lecithin, Sucralose, FD&C Red 40, FD&C Blue 2.